veg momoz. Betterbutter This griddle cheese tikka recipe gives a big thumbs up! 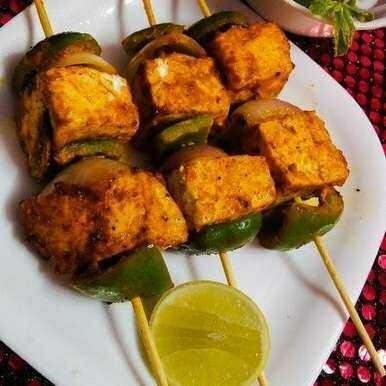 Cut paneer (cottage cheese) into 2 inch cubes, mix the paneer (cottage cheese) into a bowl with curds and limes (salt, add red chilli powder, garam masala, chaat masala, tandoori masala, cumin powder, red food color) and marinate for a few hours . Add the bell pepper and mix gently. Add the onion pieces and mix well. Now keep it in the refrigerator for an hour. Kataria take capsicum, onion, cheese, onion and capsicum cubes in that order. In each skewer you have to add two marinated cheese cubes. Heat the frying pan on the gas. Pour on 1 tbsp oil or frying butter. Keep your pickled cheese tikka sticks on the griddle and cover with a lid. Cook on low flame. In the middle you have to cook your cheese tikka sticks and well. Apply a little oil with the help of a brush. Take out on a plate. My suggestion: You can also use the Ajwain powder while marinating the mixture. This will give more flavor n a good aroma when cooked. You got a 8.38% upvote from @dailyupvotes courtesy of @jumi!